Whether it's for a good cause or to avenge her family's misfortunes as Arya on "Game of Thrones," 18-year-old Maisie Williams is proud to say she fights "like a girl." She owns the phrase 'like a girl," reclaiming it to eradicate the sometimes derogatory -- and often sexist connotations. She rocks it so well, in fact, that feminine hygiene products company Always recruited her to join them in their efforts to empower young women through the #LikeAGirl campaign. The campaign aims to champion young girls and women, while empowering them to break through limitations they encounter as a result of their gender. Maisie now proudly proclaims how many things does "like a girl." In a recent interview with Teen Vogue, she proudly stated "I fight like a girl. I fight left-handed like a girl. I fight skilled, as well -- like with swords -- like a girl." Williams spoke at this year's "#LikeAGirl" campaign launch in New York on July 7, presenting as fiercely as ever, and encouraging young women to break free from gendered boundaries and expectations. It's time for society to stop telling girls what they should and shouldn't do. And instead through the quietest whispers and the loudest megaphones tell them that they are unstoppable...The world is desperate for leaders, male and female. It's not about gender, it's about purpose. You have a responsibility, an opportunity to share your gifts with the world. People want what you've got. Believe it...Get ready for greatness. Chin up, chest out. You are unstoppable. Like a girl. The actress continued to spread the message on social media, encouraging her followers to watch the most recent "Like A Girl" campaign video and tweeting some staggering statistics. Always studies show that 72% of girls feel boxed in by society, dictating what they should or shouldn't do- It's time for this to change. And her interest in feminism is hardly confined -- to this campaign, or to issues that she is personally affected by. 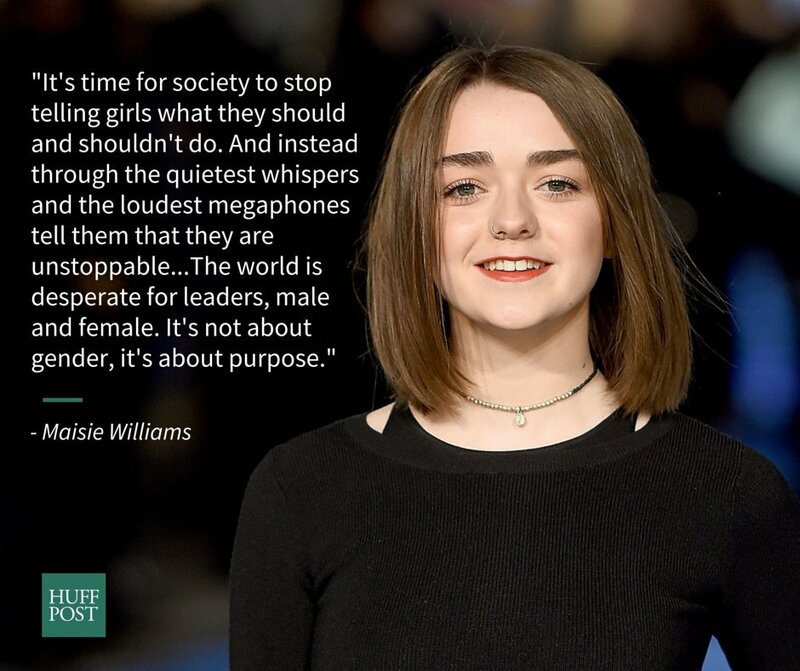 In a 2014 interview with The Guardian, Maisie said that her primary concern was not with "first world feminism," but instead more related to issues of gender inequity that women face in other parts of the world. "I know things aren’t perfect for women in the UK and in America," she said, "but there are women in the rest of the world who have it far worse." Today, empowering American girls to own what they can do 'like a girl;' tomorrow, tackling global feminist issues. All the more power to you, Maisie!